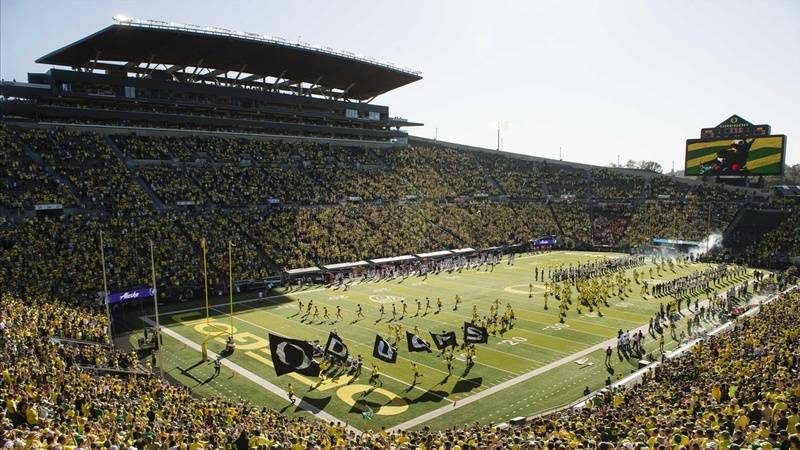 Last week we started listing reasons for those of you on the fence about going to the Oregon Spring game. Now you really shouldn’t be on the fence, but life is busy, so I get it. I’ll be making the trek North to Eugene on Friday to be ready for a big Saturday. So while we wait for Saturday to arrive, let’s look forward to five more reasons to go to the Oregon Spring game. While I've already mentioned admission is free and watching football in the Spring is glorious, another real treat is the fact you can load up the whole fam for cheap and enjoy a day at Autzen. I’ve got 5 kids of my own so I know how difficult it can be to find something to do that everyone will enjoy. Eat some food, have some popcorn and maybe, just maybe, meet a player or two after the game. I mean, you guys look at the rest of the Pac-12, you know how empty those stadiums are. It feels pretty good to be the only team in the conference to load up your stadium and get over 10,000 fans to a Spring game. With Oregon bringing in a MASSIVE group of visitors, headlined by 5-Star DJ Uiagelelei, it’s important for the success of the program to showcase a live atmosphere. The team loves it too. It’s a lot of fun to see this element of the Spring game IMO. I love watching the players giving their jerseys to service men and women after the game. This year will once again feature a heavy military theme and it’s a great chance to honor our men and women of the Armed Forces. I don’t mean ScoopDuck Juice (Which was here first BTW). I’m talking about the Juice on the sidelines. The coaches hopping around and waving a few towels on big plays. Some smack talking between the offense and defense (This means you Nick Pickett) and just the overall energy. It’s unlike anything we’ve ever experienced at Oregon. I’m not talking about ‘manufactured swag’ and things like that, I’m talking about palpable energy coming from the team, coaches and support staff you can only experience if you are there in person. Get to the damn game people.